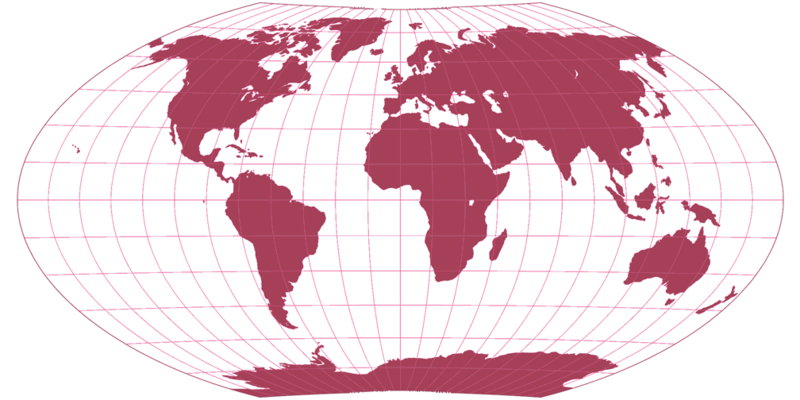 Wagner-Denoyer I Map Projection Image, red silhouette map. 15° graticule. Wagner-Denoyer I Map Projection Image by Tobias Jung is licensed under a Creative Commons Attribution-ShareAlike 4.0 International License.
. Generated with G.Projector, Geocart or Flex Projector. In case that doesn’t work, open the image in your web browser and save it manually. Share To share the image, use the single view. Please respect the terms as stated in the CC BY-SA 4.0 License. Whenever possible, please download the image to install it on your own website rather than using the File URL given above to embed it. Note: Occasionally, the variants of »other« sizes might be almost or even exactly the same size.